New7Wonders of Nature Official Finalist Yushan is the subject of an in-depth article in the Wall Street Journal, titled “Taiwan’s Great Ascent“. The feature explains the current global campaign, on track to get more than 1 billion votes, and showcases the 3,952-meter-high “Jade Mountain” that was sacred to the island’s aboriginal population, which was reputed to cut off the heads of trespassers in earlier times. Examples of the creative campaign for Yushan are presented in the article, such as 7 young people traversing the island by bicycle, visiting schools to encourage students to participate. 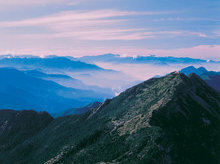 The beauty and fascinating variety of fauna and flora on Yushan are highlighted in the campaign so people can learn about the mountain and better appreciate it. While some of the 28 Finalists are well-known, there are ones which are unknown to many—Yushan is an example of a natural treasure not yet well known abroad. As New7Wonders encourages people to broaden their horizons, they discover places such as Yushan, giving a new perspective on the astonishing variety of our natural world.